Report, view, or discuss local problems like potholes, blocked drains, graffiti, fly tipping, broken paving slabs, or street lighting - just click on the link above - it's easy! And free! FixMyStreet sends a report to the council, or appropriate body on your behalf. If you prefer, you can send your report anonymously.FixMyStreet will acknowledge your report immediately, and the system enables you to monitor progress. FixMyStreet is run by mySociety, a not-for-profit social enterprise, based in the UK. FixMyStreet and other mySociety projects provide "socially focused tools with offline impacts"designed to "give people the power to get things changed." mySociety is a charitable project of UK Citizens Online Democracy (or UKCOD), a limited company (company number 03277032) and a registered charity in England and Wales (no. 1076346). 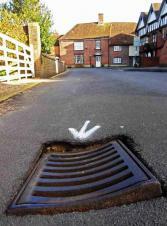 FixMyStreet, the UK's first nationwide fault-reporting website, launched in 2007. Every week, thousands of people use it to report potholes, broken streetlights, and other problems in their local area. You don't need to know who's responsible for getting problems fixed. Nor do you need to spend time trying to navigate your way to the right page of complex council websites, or deal with call centres. All you need to do is click on FixMyStreet. This is a secure site. "mySociety's work is funded by a variety of means: grants from charitable foundations, donations from private individuals, and commercial income from its trading entities."